The flower called “Edelweiss” is Austria’s national flower. In German, edelweiss means “noble-white.” Well tonight in Vienna, it was Milan who were wearing the white jerseys, and they drained any nobility out of the poor Austria Wien side. To take the analogy a step too far, Milan’s project was in full bloom against the Violets. (I told you it was a step too far.) But it was a convincing win with many positive points to take away. 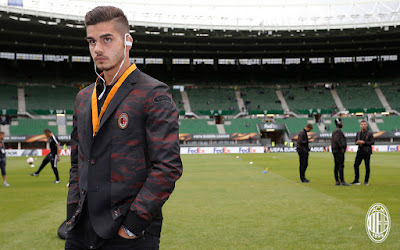 The stars of the evening were Calhanoglu (aka Sha-Na-Noglu by my fine American commentators) and Andre Silva. Calhanoglu had a shot in the third minute that was deflected just wide, but he made no mistake on his second shot. In the seventh minute, with an assist from Kalinic, he opened the scoring with a great goal, 1-0 Milan. He didn’t stop there, as he assisted in Silva’s first two goals. Yes, that’s first two, as Silva would earn himself a hat trick on the night. His first goal was in the tenth minute. Calhanoglu won the ball with a great tackle, then sent it forward to Silva, who carefully sent it just over the keeper’s outstretched leg. 2-0 Milan. Then in the 20th, he sent it into the bottom left corner to make it 3-0 Milan. His third goal was in the 56th with an assist by Kessie. 4-1 Milan. Amazing performance by Silva. Will Montella believe in them now? Looking back to the first half, Abate completed a successful cross… to the keeper, in the 33rd. Not a lot was created on that side, and I don’t think that was a coincidence. Abate was also involved in injuring poor Westermann, who had to be subbed off in the 42nd for Borkovic. Who, ironically, was the one who headed in the consolation goal in the 47th. It seems Zapata didn’t get the memo that we stopped conceding goals from corners. 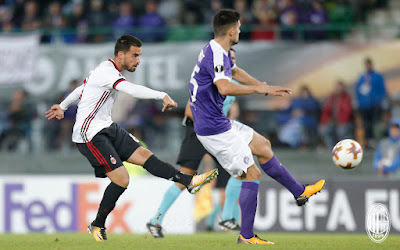 After a very unfocused start to the second half for the second match in a row, Silva’s goal helped regain some focus, and then Suso scored one minute after coming on for Kalinic in the 63rd. It was a brilliant kick from distance that was slightly deflected by Kadiri, who had also just earned his side’s only yellow just five minutes before. But that exquisite Suso goal made it 5-1. Despite my darkest fears about the 3-5-2, it worked out well against one of Austria’s best sides. 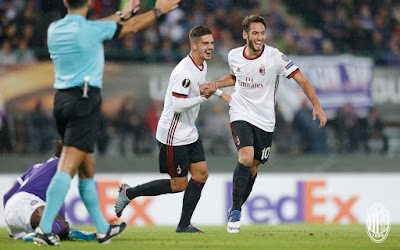 Oddly enough, it worked out well because Montella put his faith in two players he has not put much faith in before now: Silva and Calhanoglu (or in American, Sha-Na-Noglu). Whether or not it will stand the test of Italian sides remains to be seen. 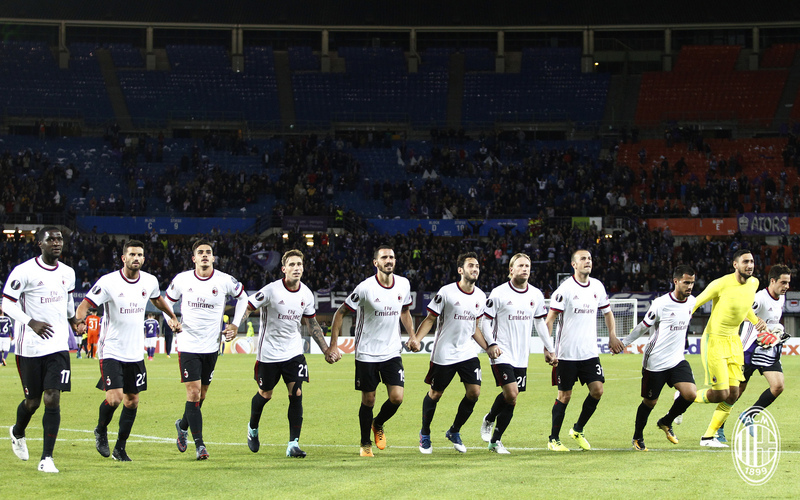 But to Montella’s credit, his subs were finally impactful… for the second match in a row. And, he learned to not play Borini and Montolivo together… or at all, having left Mr. Fitness at home in Milano and Montolivo on the bench. So maybe there is hope for Montella. Or maybe he just got lucky against a weaker side. Sorry, Diesel, no thanks. Last year's suits were so much better. Speaking of weaker sides, Italian sides were winless in their first Champions League group stage matches this week. However all three Italian clubs won today in their Europa League group stage matches. Atalanta dominated over Everton with a 3-0 win. Lazio came back twice to defeat Vitesse away 3-2. And of course, Milan’s 5-1 away win over Austria Wien. For me, this shows how much more competitive Serie A looks to be this season, with the places fourth through eighth looking stronger and more likely to challenge those top three. But for our evening in Vienna, our win was as refreshing as beautiful white flowers dotting the Austrian alps. The white jerseys worn with the black shorts (because Austria Wien were wearing white shorts) looked great, and even if Austria Wien lacked the quality of Milan, this win will boost confidence a lot. A lot of positive individual performances, and much fewer errors made this game enjoyable to watch. A reaction from coach and team to create a memorable night in our first official match in our return to Europe.